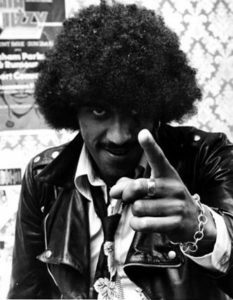 Philip Lynott, The Fox, and Romanticism. . . This was originally a part of an overly large out of control post that I have since sliced up. To see the various slices, go to Two Poets. 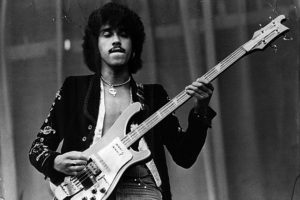 Philip Lynott and his bass. And this, what I briefly describe above, bears a resemblance to the world that Philip Lynott draws and depicts with his lyrics. The album, Johnny the Fox, quickly comes to mind. I always found this album interesting. It offers up to the listener a series of individuals. Most of the songs on that album are aural portraits. The opening track, Johnny, is the tale of a junkie. He is struggling. His sister, who is a nun, does not know that he has gone bad. When they did tell his father, it drove the old man mad. To deal with his addiction, he breaks into a drug store. Now the police have chased him down and now have him cornered. Philip offers odds on his surviving this situation. He could have given himself up earlier, maybe? He does not. Philip shares that a heart and chain are recovered from the alley after the confrontation, after he is shot dead. The picture in the heart had been removed. I assume Johnny took the image with him. That is the first song. Go onto the second track, Cocky Rocky, a straight forward tune of an unapologetic rocker. He just loves the life. He loves the chicks. He loves taking to the stage. He is just enthralled by the night, cruising down those neon streets. And he gambles. He does not know not what will happen. He is simply driven by his appetites. The third track is Borderline, written in the first person. Again, dealing with a man’s addiction, but as the title says, he is a borderline case. The man has an issue, or is close to having an issue. He has not arrived there yet. You are shown how his addiction to alcohol is growing. Philip laments in one verse that “Seven beers and still sober, Time to change to something stronger.” The chorus is “Back on the Borderline, One more time.” It has not gotten him, yet. Close, but not yet. And the fourth track is Don’t Believe a Word. 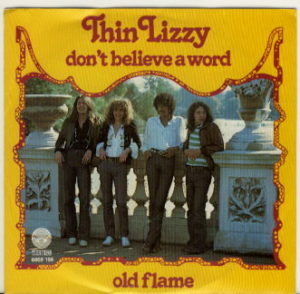 A classic Thin Lizzy song. Like Borderline, this is another complicated portrait. It is again in the first person, this time a lover sharing with his beloved. Warning her, his lover, not to believe him. Warning her that he will lie and cheat to have her, and that he might have even written this song for some other silly pretty girl. He is basically telling her, I am not good enough for you. It is a weird manipulative song that is yet somehow still a love song? 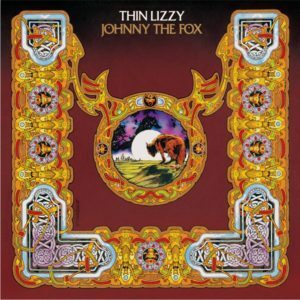 The fifth song of side one of Johnny the Fox, Fools Gold, offers up several individuals, after referencing the famine and Black Death, when many set sail for the Americas for a new life. Again lamenting though that there were some, however, who could not cope and it were these who were searching for fools gold. He goes on to introduce a lone prospector who stands at the side of a four lane highway. Neither he nor those whizzing past him really comprehend the other. The next verse introduces a man who has hit bottom, He has nothing left. He is a drunk on skid row. Still he goes into the bar and asks for wine, but they will only serve him water. We are told that the bar does not sell sympathy. After each of these is the chorus, Fool’s gold. . . Fool’s gold. The final verses involve an allegory or fable involving a fox and vulture. . .
That is the first side of the album. Each of these portraits showing us a unique, tormented and challenged individuals. All no doubt are pieces of Phil’s psyche. No doubt he was pondering his own appetites and addictions. Each of these portraits, or the characters they represent cling to and fight for life. Each of them are uncertain of their fates. Not one of them knows what will happen, but each goes on. Now I am not suggesting that Philip Lynott was reading eighteenth century German literature. That was not the case. However, that literature did find its way to him. The French themselves in the nineteenth embraced components of what we describe above. Authors such as Victor Hugo with the Hunchback of Notre Dame and Les Miserables quickly come to mind. Alexander Dumas with the Count of Monte Cristo and the Three Musketeers is another. Mary Shelley, an English woman, offered up Frankenstein, and a whole host of others, including several Irishmen! All of these fall under the category of romanticism. All have a focus on the individual, on subjectivity, on emotion and drive, and the often violent actions that result from such. All of this is contra what was or is commonly accepted, what properly involves appeals to authority, practice, and reason. Of course these are primarily prose, but the themes are still there, whether in prose, theater, or poetry. There is still a focus on subjectivity, emotion, and action. And so much of Philip’s work, though lyrical, is prose. He is routinely telling a story, whether it be the tale of Johnny or Johnny the Fox and Jimmy the Weed, or Jailbreak. When we explore Romantic poetry, however, we have not only stories but a range of topics and domains. We find a celebration of nature. We find an embrace of ancient myth and folklore. We see at the least a nod to religion and an embrace of mysticism. And lastly there is a desire to return to simpler times and a faith in native custom and tradition. All of these can be found in Romantic poetry, along with that initial subjectivity, that “Sturm und Drang”. It always returns to that subjectivity. A subjectivity that rejects the rational and universal, the logical, the modern. Romanticism ultimately challenges the factory and mass manufacturing, the capitalist system where the results of your labor belong not to you, the bureaucratic state where each is assigned an ID number, again modernity. Lynott never really goes to the political, as is true of most romantics. He does embrace, however, in his lyrics not only the subjective but the native customs and traditions. He is a proud Irishman. Songs such as Vagabonds of the Western World, Emerald and Black Rose. All pointing to the history and folklore of the Emerald Isle, its people, its kings, the battles fought, and the literature detailing such. And it is this fascination for Ireland, its culture, and its literature along with that embrace of “Sturm und Drang” that define Lynott. These elements define him, not only his lyrics, not only him as an artist, but his persona – the man we saw on and off the stage. Rock’n’Roll owes a certain debt to romanticism. That subjectivity, that “Sturm und Drang” is very much present in rock. That emotional depth, that moodiness, that joy, that sadness, that rage. . . of both songs and artists. The violence, the uncertainty of the music, and its performance. And then you have that communion with the audience. All of this is romance. It is feeling, it is emotion. Little or no reason, not rationality. Today, fifty or sixty years in, some of it has been lost, but if you go to a live show, you can still experience it. A good act is more than just volume. Such an act will engage and it is through both their musical and emotional expression, their energy in that room, their passion on that stage, and the audience’s response to all of that which is experienced. Previous story A Boy From Frenchtown. . .
A Conclusion and Other Thoughts on Two Poets. . .